Sister Viola Lausier forgives the hit-and-run driver, gives thanks to her rescuer and says God just wanted her to take life a little easier. BIDDEFORD — Sister Viola Lausier had a full day planned. She was going to go to the bank, put an employee on the payroll and get ready for three meetings at Saint Andre Home, a social services agency for pregnant women where the 89-year-old nun has been the finance director for 30 years. But she barely got out of her house that morning before her priorities suddenly changed. Around 7 a.m. on Nov. 18, Lausier was crossing Elm Street from her house to Saint Andre Home – as she has most every day after her fruit, coffee and morning prayer – when she was hit by what police said was the side-view mirror of a passing vehicle and left lying face-down in the middle of the road. The driver kept going and has not been found by police. Lausier said she has already forgiven the driver, who she is sure had reasons for not stopping. She’s also sure that God had reasons for allowing it to happen. “I think He wanted me to slow down,” she said, her right arm in a cast and rosary beads wrapped around her left hand. 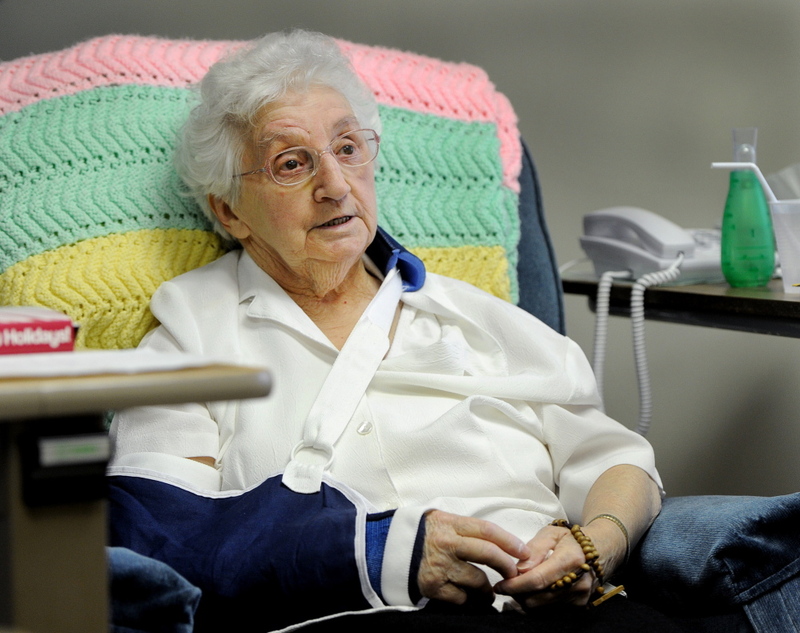 Three weeks after she suffered a lacerated liver, collapsed lung and other injuries, police are still investigating and Lausier is recovering at St. Joseph’s Convent on Pool Street, a housing complex and nursing home for nuns. She spoke about the incident one morning this week while sitting in her room, the waves of her short white hair neatly brushed. Sister Theresa Therrien said Lausier is known for her energy – she often goes to work seven days a week – and for her strength, which showed Tuesday, even from the recliner. Her upbeat attitude and easy laugh belied her true condition, Therrien said. Get-well cards stood on every shelf of a bookcase and covered the top of the dresser in her room. A basket full of them sat next to her chair. “Sometimes I take it and read them again. It fills my heart with gratitude,” she said. She’s most grateful for Timothy Pilz, a 25-year-old custodian from Limerick who was driving along Elm Street on his way to work soon after the accident happened. Pilz said he didn’t see Lausier get hit or fall, but saw someone lying in the street that gray morning as he got closer to the site of the hit-and-run. “I watched cars drive by,” said Pilz, who pulled to the side of the road when he reached Lausier in the street. She was conscious, but she couldn’t get up. She called for his help. 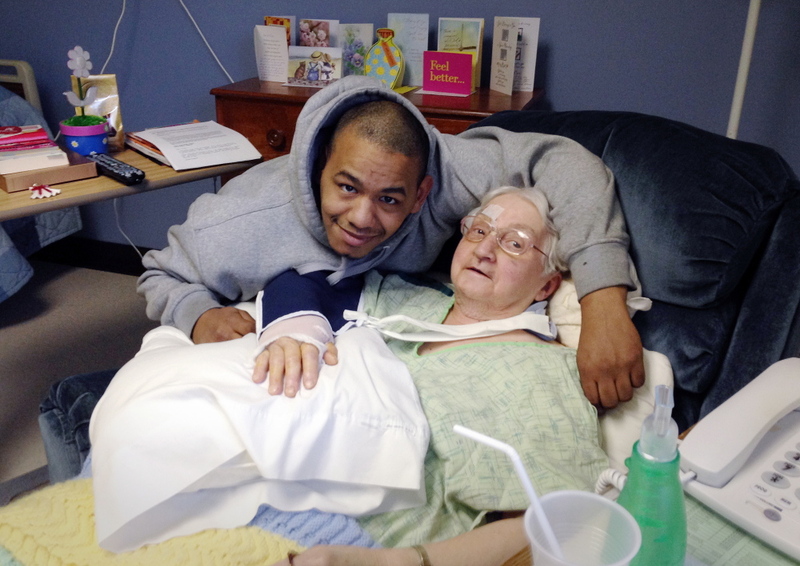 Pilz lifted her and helped her walk back to her house, where she lives with five other nuns. The other sisters had rushed to the door after one of them heard a thump, and looked out a window to see Lausier. “Blood was running down her face, on her hands, on her clothes,” Therrien said. Pilz called 911 and waited for the ambulance to arrive before he left for work. He didn’t think much about it after that. Lausier was treated in the emergency room at Southern Maine Medical Center and released later that day. But back at St. Joseph’s, she had trouble breathing and keeping down food. Two days later, she had an appointment for her arm with an orthopedic surgeon, who sent her back to the emergency room because of her symptoms. A full-body scan revealed the internal injuries, and she was transferred to the trauma unit at Maine Medical Center in Portland, where she stayed for several days. While in the hospital, Lausier told a television reporter that she wanted to meet the man who helped her – the good Samaritan, she calls him. “I don’t think I did anything more than a normal human being with a heart would have done,” Pilz said this week. He didn’t realize that the woman he helped was a nun until his girlfriend told him about the newscast. As requested, he went to meet her at St. Joseph’s a week after the accident. They had pictures taken together, which meant more to Lausier than catching the person who hit her. Police still don’t have a description of the vehicle or the driver. Lausier told officers not to look anymore. “I said, ‘I think you should drop it. You have so many other things to do,’ ” she said. 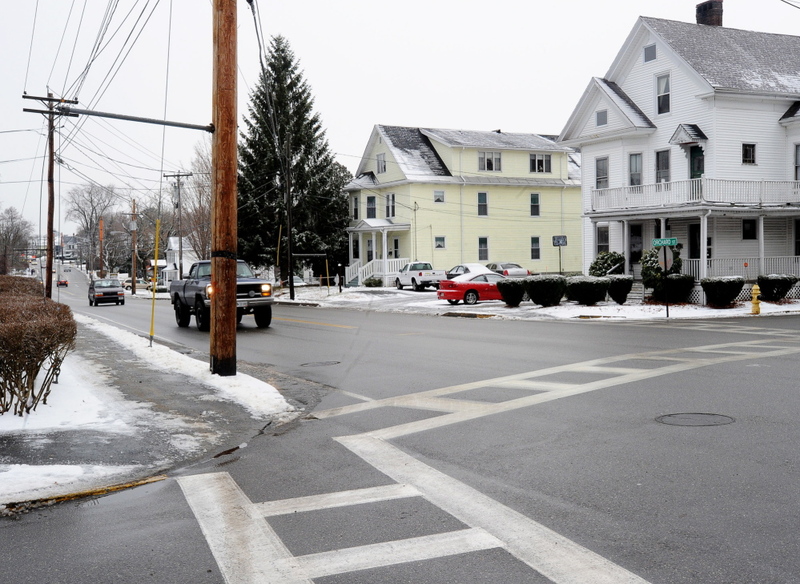 Biddeford Deputy Police Chief JoAnne Fisk said Tuesday that there have been no new leads, but the investigation remains open. Lausier remembers little about the accident, but said she didn’t feel pain. “I was under shock, so I was doing well,” the nun said with what French-Canadian accent she has left from growing up in Grand Isle. The second-oldest of 16 children, she helped raise her siblings and, from a young age, felt driven to help others. So, when she was 16, she joined the convent. Given the way she has spent her life, it’s not surprising that Lausier forgives the driver. And, because of that, Pilz does, too. “She’s moved on. Everybody else should. That’s what she wants,” he said. Lausier probably won’t be well enough to go back to her home on Elm Street for at least another month. She’s been keeping herself busy reading and saying the rosary. She has started getting some work done, too, writing with her left hand for the first time in her life. That’s an upside of the ordeal, Lausier said, laughing. By the time the cast comes off, she’ll be ambidextrous.